Pineapple almond was one of my favourite frozen yogurt flavours growing up. 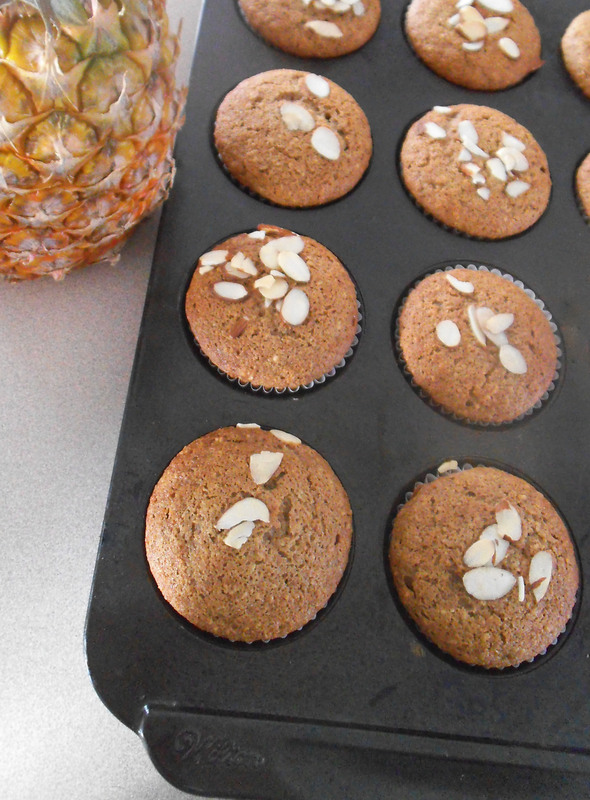 That combination of fruit and nuts reappears in these lightly spiced muffins. Given that they are gluten free, I was surprised at how authentic their texture was. Eggs and buckwheat work well together though, as previous recipes like Chocolate Buckwheat Waffles have proved. Still, my expectations were exceeded. I could hardly believe that these were wheat free! With the holidays coming up, I plan to make more of this bread as loaves to give away. I doubt anyone will be able to tell this recipe is gluten free. The taste and texture are delicious, which puts me in the mood to share it. 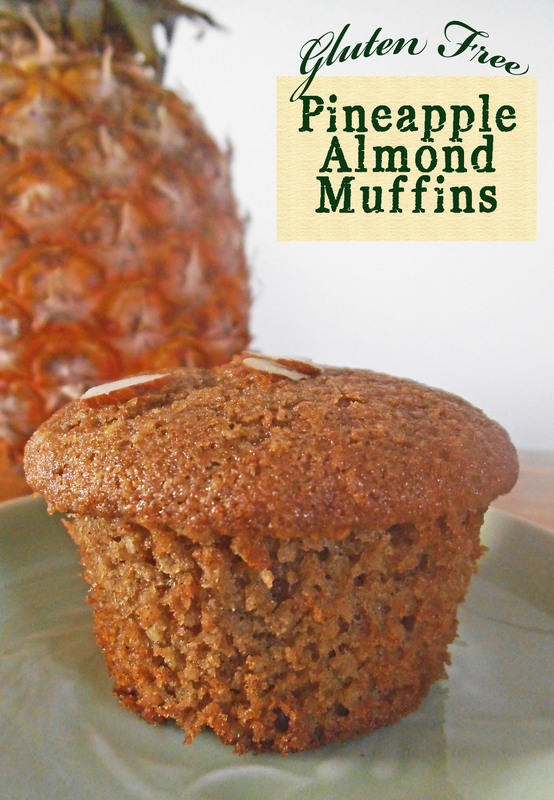 With this recipe, you can enjoy some pineapple almond goodness too! Combine flour, ground almonds, salt, baking soda, baking powder, cinnamon, and cloves. In a separate mixing bowl, blend together sugar, oil, honey, and eggs. Stir in almond extract and pineapple. Add dry ingredients and blend well to form a semi-thick batter. Preheat oven to 350 degrees F (180 C). Pour batter into lightly greased muffin liners or cups. Top with sliced almonds. Bake muffins for about 15 minutes, until toothpick inserted into the center comes out clean. If making loaves, pour batter into loaf pans lined with greased parchment. Bake for 30 minutes or longer, until toothpick comes out clean. Wednesday Whatsits and Pennywise Platter. YUM. Totally trying this . . . after I get some buckwheat flour . . .
You could try these with conventional wheat flour in place of the buckwheat if you don’t mind the gluten. Either way, they should be good! Do you mean 1 cup of almond meal or is it really chopped almonds, but finer? I used 1 cup of almond meal that I bought at a bulk foods store. Sometimes it is called almond flour. However, I’ve heard that you can make your own almond meal. If you try it, I think you have to be careful that you don’t process the almonds into almond butter. I hope you get to enjoy the muffins soon! Could you use Bob’s Red Mill Gluten Free All Purpose Baking Flour in place of Buckwheat Flour? I think it should work just fine. Try it and let me know how they turn out. 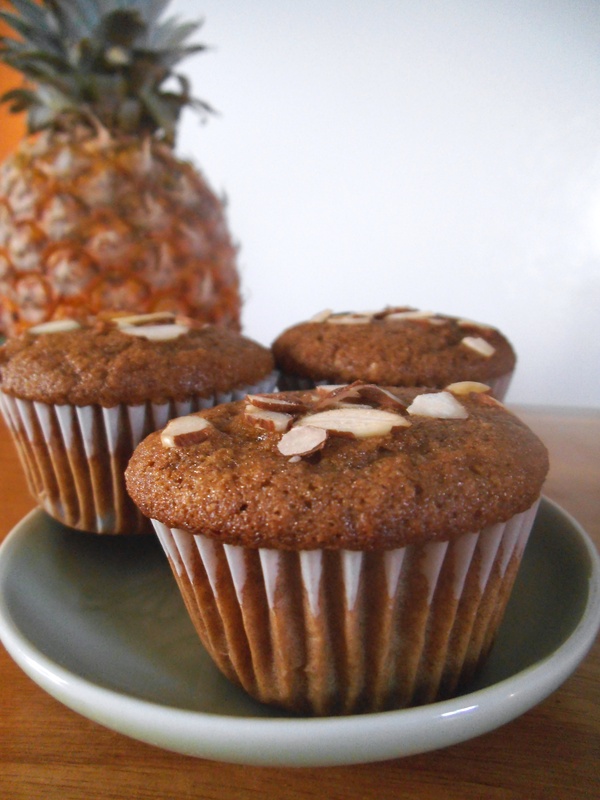 Pineapple and Almond sound like a great combo! Stopping by from Saturday Dishes. We are taking over in January. Thank you for linking up. We hope you continue to do so. Pineapple and Almond sound great together. Stopping by from Saturday Dishes. We are taking over in January. Thank you for linking up. We hope you continue to do so! Thanks. I do plan to continue. The last year of themes has been so much fun! I am thrilled to hear that you liked them! You just made my day! There are certainly some great resources out there to help you find your way. I’ve got some experience, but I’m not an expert. Perhaps you could consult Problogger for more advice: http://www.problogger.net/ There’s a helpful article featured there that covers what a new blogger has done in her first 3 months. Yum, hadn’t thought about putting pineapple in a muffin! Pineapple in muffins is SO good! And if you veganize the recipe, you won’t have to worry about the pineapple affecting the egg protein. You should go for it!